Deribasovskaya Street Isnamed after Don Josef de Ribas. 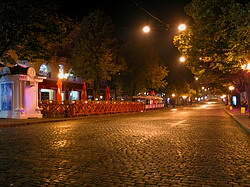 This street is the very heart of Odessa. What lends Deribasovskaya its unique character is magnificent architecture, crowds of people leisurely sitting on terraces of numerous cafes and restaurants, perfect cobblestones, no vehicle traffic and big shady linden trees. This special character has survived even through the Soviet times when conforming Soviet canons was highly recommended. The Souvenir Market with a crowd of artists and craftsmen demonstrating their works is situated right here. Prices are really low, and some items are gorgeous. Bargains are common. Don’t miss it if you want to get originally Odessan souvenirs.